One of the things that resonated with me about OOW was how the Fusion Applications are driving the development through the stack and no where is as obvious as the middleware. In fact in all my presentations I talk about Fusion Applications being a window on FMW. 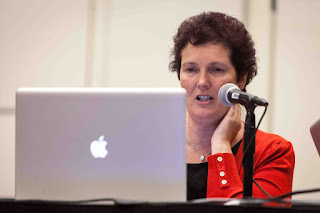 At OOW ADF mobile was launched, the ability to code once and deploy across a range of mobile devices. Oracle must have been listening to me as they very cleverly had put ADF developers into the User Experience team to create apps for Fusion ahead of the launch. The team headed by fellow Brit VP Jeremy Ashley understand users and they have the skills to understand what works well as a mobile app. 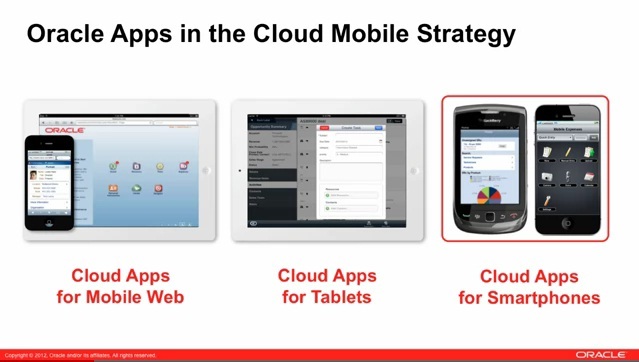 But lets step back a minute, Oracle have 3 kinds of mobile delivery for Fusion. These are not simply putting Fusion Applications onto mobile, it is NOT a rewrite after just a year as I have heard asked. Fusion Tap is Fusion Applications deployed for Tablets; it was demonstrated by Chris Leone SVP for Fusion Applications at OOW, but if you missed it watch this excellent video. Fusion Tap is a single app that recognises all the security and access of your Fusion Applications implementation and most importantly also works offline. 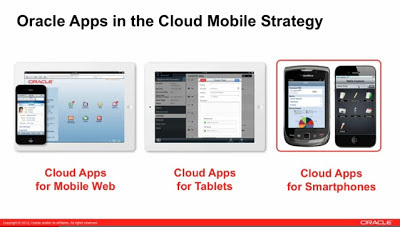 Oracle ADF builds the Cloud Apps for Mobile Web. The new face of Fusion (Project Fuse, is the internal name) are example apps written using ADF. Using ADF means that you can deploy a browser based application on any device, tablet, desktop, netbook etc. 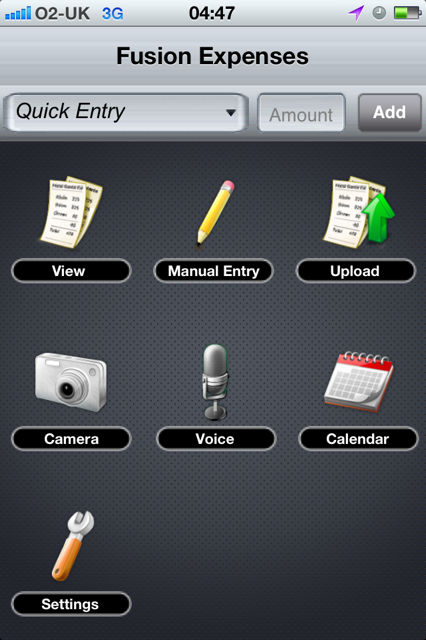 These are applications that make life simple for casual or mobile users. They don't replace the professional interface and as explained by Jeremy, think of what you do on your smartphone, you may use an airlines full site for browsing and selecting flights but once booked the mobile apps on the go and in your pocket allow for checking flight status and online check in. A great pride of mine is being the catalyst for the FXA program run by Misha Vaughan in Jeremy's team, these Fusion User Experience Advocates are all from the ACE program and are experts from across the middleware (plus me ) who have an in depth understanding of not just the product and technology but also the science behind usability. 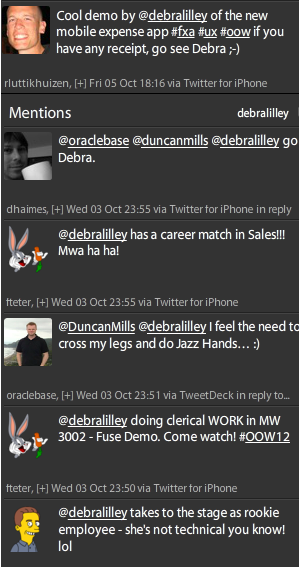 Last year the training was extended to a group of internal people under the SAMBA (Sales Ambassadors) banner. Working with sales people can be a challenge for me :-) but actually this team is really about sales specialists who are called upon to explain the product rather than the pricing. Not much different from me then (just don't tell them). We had another day of training on the Wednesday before OOW, before the ACE director briefings (OOW is a bit like Christmas, we start the process earlier and earlier every year). This time we looked further at the extensibility of the applications and of course we spent time learning about and how to demo the Fuse applications. Oracle loaded them onto iPads and onto my new Fujitsu android tablet. Initially ADF mobile has iPad and browser support, so on the android I am using a browser version but it behaves identically. One of the highlights of my OOW was when Jeremy asked 3 of the FXA team, Basheer Khan, Edward Roske and myself to demo these applications in his general session. What really impressed me was the number of ADF developers who attended the session, backing my theory about Fusion Applications being the window on the technology. One of these developers Wilfred vander Deijl filmed the demo. The third category of mobile are specific smartphone apps. I have the Fusion expenses app loaded on my iPhone which was written in native java and uses OCR to scan receipts and I must of scanned most of the issued receipts in San Francisco during OOW showing people the functionality. Note. In an earlier draft of this post I incorrectly stated that Fusion FUSE was ADF Mobile. It is ADF but the project started before ADF Mobile was available. ADF Mobile as a tool makes the process of developing and deploying mobile apps even easier. hi you have gathered a valuable information on sap...., i am looking for content like this and i am much impressed with the information and nice course content, thanks a lot for the Information regarding Oracle ADF Online Training. valuable information you have searched.I was really searching for such a nice post and got here.Thanks for sharing such a type information, its beneficial for me...Keep sharing more about mobile apps development. Don't Tell Larry He Thinks We're Working!